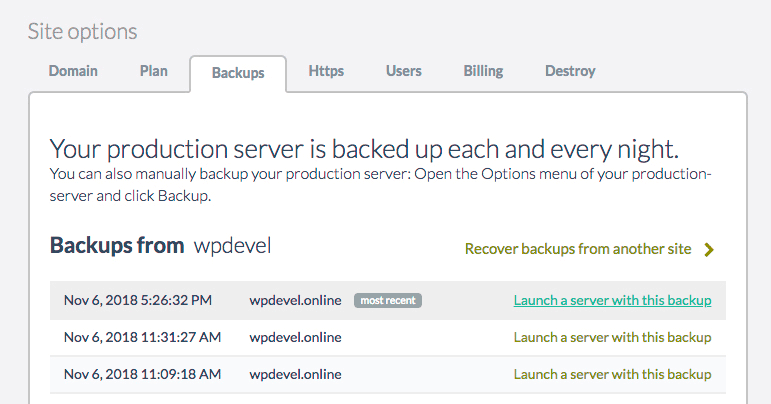 With all Wetopi plans, you have Amazon S3 backups you can easily restore. Best part is that restoring backups with Wetopi is extremely easy. It’s 2 Clicks of a mouse! You don’t need to install any WordPress Backup Plugin. You don’t need to touch your production site and disturb your current users. You don’t need to reinstall your WordPress. You don’t need to fill any config form. You don’t need to touch a line of code. You don’t need to rename links, resource paths. You don’t need to touch your WordPress database. Jump to the detail page of the site you want to restore. When you restore a backup, you are launching a completely new server. This way, your production server, the one with the real domain and real users, is not modified at all. This gives you time to preview and check if your restored backup is what you want. 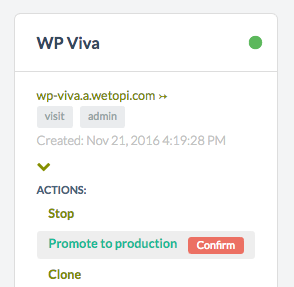 With all Wetopi plans, your WordPress Site will be automatically backed up each and every night. You can also launch 1-Click backups! all it takes to begin backing-up is a single mouse click. And you will have up to 15 days of backups stored on Amazon (durability of 99.999999999%). At wetopi, we want to minimize the friction that every professional face when working and hosting WordPress projects. In short, we are just techies passionate about WordPress. With wetopi, a specialized WordPress hosting, we want to go further to offer professionals and agencies a platform to work efficiently and effectively. 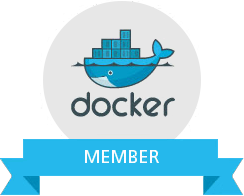 Free full performance servers for your development and test.